Your task today is to either think of or research a project that embodies that house/animal. It could be a knitting or crochet pattern – either of the animal itself or something that makes you think of the qualities of that house. Today's challenge from Eskmimi for Knit and Crochet Blog Week is to plan out a possible project that represents your House mascot. As I talked about yesterday, I placed myself in the House of Manatee. As I sat and brainstormed about possible mascot projects, I came up with several ideas. A giant stuffed manatee- or a tiny ami manatee-- taking the project totally literally, and making a mascot in one of several sizes. Because I still relate to the other houses, mainly the color of the peacock, I knew my manatee would not be grey. My first thought was to hold 2 yarns together, creating a mottled effect that would look like a sea animal. Being a sutffed animal, a manatee would embody the characteristics of its house simply by being. A stuffed toy is cuddly and comforting. 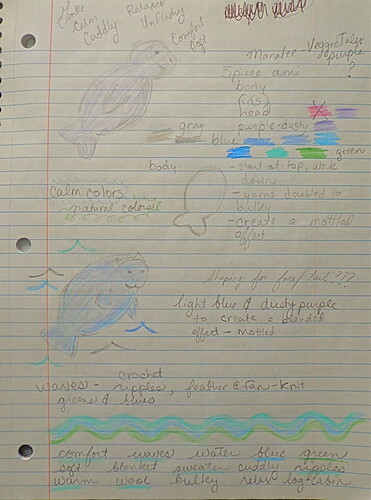 If I was not going to make an actual manatee, I wanted to really represent a manatee. 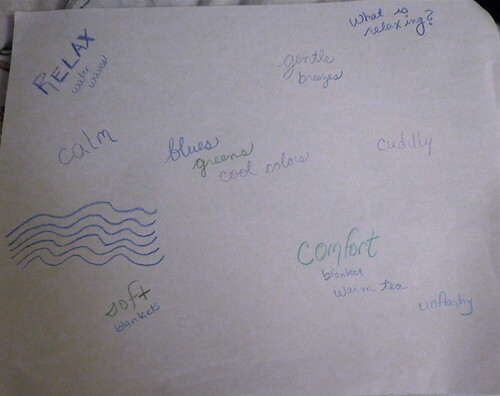 Calming colors came to mind-- soft blues, greens, and purples. The color of water, the ocean. I find the ocean really relaxing, and I felt like this idea further expanded upon the characteristics of a manatee. So, something blue or green would definitely be a possibility. When I thought of the ocean, I thought of waves, which took me to ripple patterns. They exist in both crochet and knit, and if done in the right colors, could successfully embody the House of Manatee. From ripples, I started searching my favorites and my queue for ripple ideas. Two patterns stuck out in my search- a ripple blanket like Lucy from Attic24 makes frequently, and this cardigan which I've been meaning to make for some time. To go with my color idea, I would need to use either green or blue with either of these projects. Oddly enough, I found that because I've had another ripple blanket in mind for a while, and I've wanted to make a cardigan for a while, I have yarn in my stash for both of these projects. A blanket or a cardigan? Both represent the comfortable and cuddly side of the Manatee House, and both of them want to be made :-) Through my reflecting on this challenge, I have found several projects that I would now really like to make. In color, technique, and end result, these projects represent how I feel about being a part of the House of Manatee. Now all that is left is for me to decide which one to start first! Oooh ripple ripple ripple!! With appliqued manatees or not :-) Would be lovely. Very cool! I love your ideas. oooh a ripple blanket is very manatee. I feel this challenge is not good for my bee-like nature. 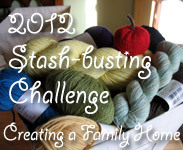 I keep visiting blogs and wanting to knit what they're finding! Wow, it was really neat to read about your process. I found lots of bees and monkeys, and their projects were pretty self-explanatory, but I couldn't imagine how the manatees were faring with this assignment. I especially liked that you took a detour from the obvious and went deeper. 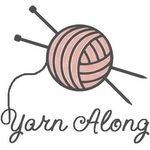 And how very fortuitous that you had the yarn at hand!! Love the detail in your thought process. I think your the first Manatee I've come across. Have fun with your blanket! Great post! 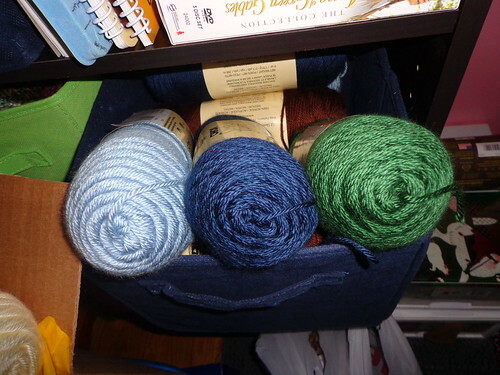 I can imagine how lovely either the blanket or cardigan will look in blues & greens. I should have gone with the hand-drawn infographic...it would have saved me so much time!